In the times of modern age, when there is technology booming everywhere it would not be just to leave football out of it. So taking in consideration this notion FIFA's president, Sepp Blatter has made it clear that he would fully support the use of goalline technology in football.Sepp Blatter was talking to CNN in an interview where he made the point, that he would be in the forefront in the implementation of this technology. Earlier Blatter has been very sceptical about the use of technology in the world's most followed sport, but now it seems that he has bit loosened up his stance. This would be a great revolution in the game, as technology blended together it would be a great match all together and would cater for controversies that arise many a times. 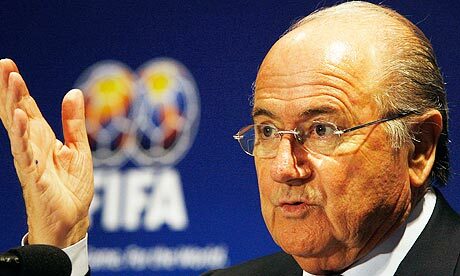 "We have tested 17 different goalline systems and four or five of them will go to the International Board to have a further look at them," said Blatter. Also in his interview he advocated about the change of the schedule for the 2022 Qatar World Cup, and deemed summer World Cup to be unfair. "If you ask me the percentage to play in their winter, it is definitely over 50%. It means this is more than just a probability to play in winter time," continued Blatter. He also spoke out his concerns about the homosexuality issue in Qatar, and urged that the basic human rights to be honoured. "We will push Qatar to make sure the World Cup will be played in such conditions that other World Cups have been played and that human rights are respected." He also talked about the voting system , for which FIFA was under great amounts of pressure and awarding World Cup hosting to Russia and Qatar for 2018,and 2022. He asked those who being skeptical about the system , should propose a new one rather than talking. "The FIFA congress decided that it must go to the Executive Committee and by a secret ballott. It is transperancy according to Swiss law".